Echo is another excellent Eternal keyword. When you draw a card with echo, you draw an extra copy. Card advantage is just as big a deal in Eternal as in Magic, and that makes echo dangerous. Most echo cards cost ½-1 more than they would otherwise, so most of them are worth running in Limited regardless, and in Constructed if you make any effort to synergize with them. 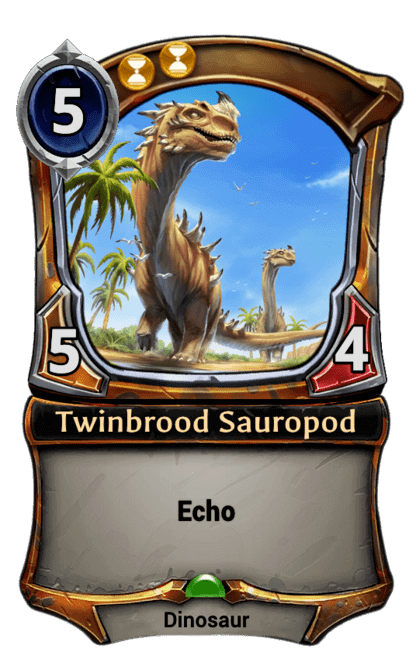 Now, that premium is payed twice if you actually cast both copies, and you'll never be casting both Twinbrood Sauropods in the same turn, but the value of drawing an extra card is considerable, especially when you know what it'll be. Inspire and echo are best friends. Inspire makes drawing units better and echo helps you draw more units. Imagine the carnage you can wreak with a Trumpeting Warhowler and some Clockroaches. You'll play your Thunderstrike Dragons much sooner via Journey Guide. Especially if you put one of the two copies back on top of your deck with Second Sight, which combos with both inspire and echo. There are a few echo spell cards. Herald's Song helps you draw cards faster, Accelerated Evolution buffs your units (it was strong enough to be nerfed by +1 cost), and Unstable Form is unreliable removal, but it comes in pairs, is dirt-cheap and can occasionally be of use on your own units. Water of Life is unplayable life gain (except perhaps in a lifeforce deck) and Find the Way is a weird bit of mana fixing. The last non-unit echo card is Ornamental Daggers, generally weak but great alongside Oni Quatermaster and the like. Offering 4 flying power, Pteriax Hatchling sees a lot of play in Limited, and as a cheap echo dinosaur (dino tribal is a thing), a bit of Constructed too. Yeti Troublemaker is the worst echo unit, but yeti tribal is a thing too. 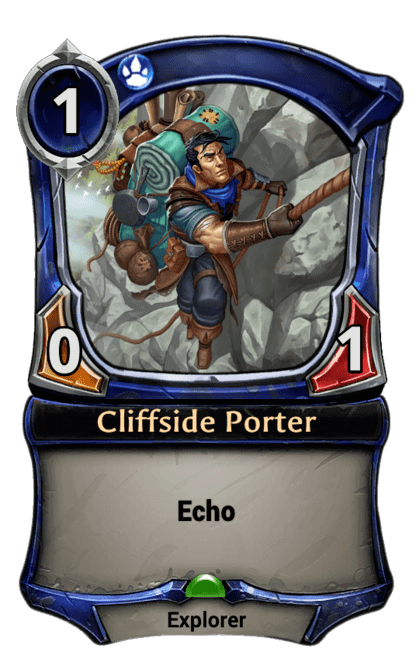 That just leaves Cliffside Porter, which is unplayable in Limited, but key to a Nostrix, Lord of Visions deck as well as any decks that just want fodder to discard: Lethrai Secretweaver, Torgov, Icecap Trader, Whispering Wind, the cycle-bear cycle, Herald's Song, and many more cards. Elysian Trailblazer grants echo to the top spell of your deck, which is neat, but at a cost of 7, doing the work to make that worthwhile just isn't feasible. Elysian Pathfinder is in the same boat, if a bit closer to the front. 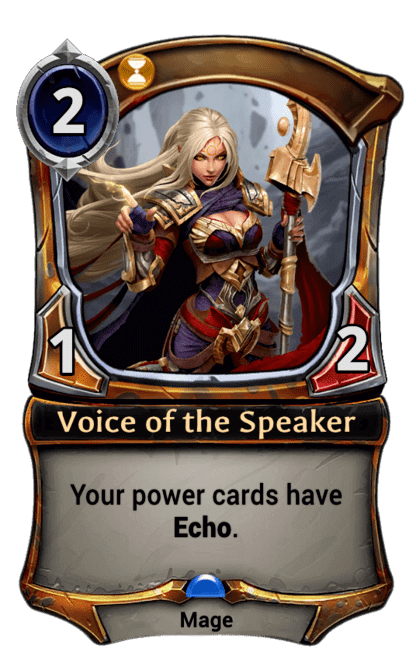 The only other card that grants echo is Voice of the Speaker. It only grants echo to your power cards, but that's a third or more of your deck and as a two-drop could significantly aid your board development. There aren't many echo cards. It was released in the first set and there's only been one promo since. It's pretty clear that adding many more viable echo cards to the format would be quite dangerous; Because of the card advantage and synergy, each new echo card threatens to be either useless or ubiquitous. Narrow echo cards like Yeti Troublemaker might be the only way to move forward with the keyword. That there's not a big future for echo isn't a failure: What we have is fun and gives players cool things to do. A small success is still a success. Echo and Flashback share a lot of DNA to me. I could imagine a variant like jumpstart that turns a card in your hand into a copy of a card, or turns the top sigil in your deck into a copy of the card when drawn/played. Yeah, echo is Eternal's flashback. It's cleaner and more interactive, but locking both costs to be the same limits the variables. Even so, that makes me think echo might have more space than I was thinking. 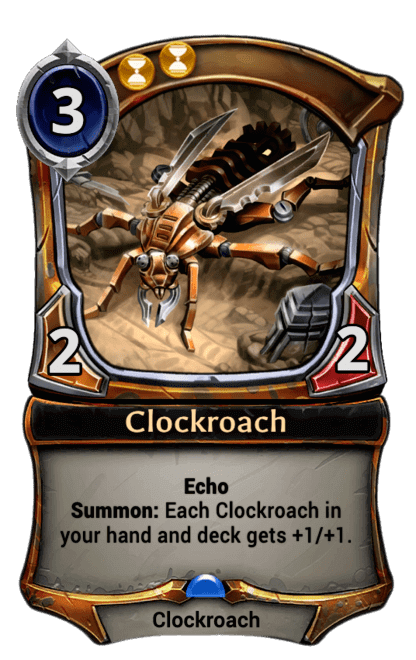 Flashback exiles the card on the second cast, echo doesn't have any built-in limiter to the number of times you can play it. Personally, I hate playing against it. It's all the unfun repetitiveness of Dredge-as-intended, except your recursion gives permanent buffs and there are even fewer ways to interact with it (silence and voidbound, iirc). Though I should add this is a specific function of the kinds of synergies that abuse Echo cards (Crown of Poss/Dark Return/Second Sight), and not inherent to the mechanic itself. Good point. There are few counters to an echo strategy. You can use discard, but they can hide cards on top of their deck. You can mill, but that doesn't hit the cards already in hand. Even if you do both, they might be drawing from the void.